After a ten-week mental health and wellbeing programme, which involved table tennis classes and fitness workshops, a number of residents at Trellick Tower in North Kensington got the opportunity to show off their new skills to Great Britain Paralympic table tennis gold medalist, Will Bayley MBE. The Think Active initiative was delivered in partnership with London Sports Trust to support residents’ mental and physical wellbeing as part of major refurbishment works being undertaken at the tower block, by Wates Living Space. The programme culminated in a visit from Great Britain Paralympic table tennis gold medalist, Will Bayley MBE, who Wates Living Space is supporting in the lead up to the Tokyo Paralympics in 2020. Will joined residents to see their new table tennis skills in action and talk to them about his experience in overcoming adversity. 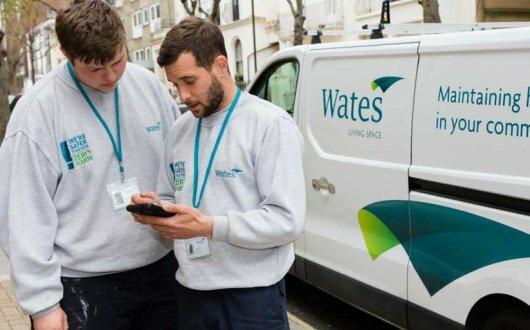 Throughout the programme, Wates Living Space also connected residents to local mental health services, including London Sports Trust’s charity partner, Mind. Think Active forms part of Wates Living Space’s work at Trellick Tower on behalf of The Royal Borough of Kensington and Chelsea to undertake essential external repairs and decorations. This includes concrete repairs to the fabric of the building, restoration to all windows and sliding doors and the replacement of all communal Crittall windows. Redecoration to timber panelling and coverings on all balcony areas will also be undertaken as part of the project. Think Active is a first class initiative and it’s great to see our residents benefitting from it. The Think Active programme at Trellick Tower closely follows Wates’ 100 percent score for its tenant engagement under the Tenant Participation Advisory Service (TPAS) 2018 accreditation. Our teams work tirelessly to find new and innovative ways to support the communities in which we work, be it offering a simple support service for residents or providing training opportunities for local people.